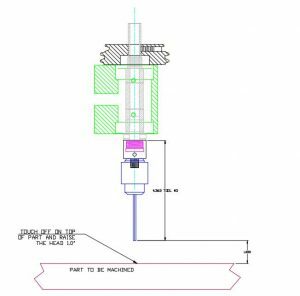 Below are a few problems and solutions relating to problems that have been noted in EMC and EMC2 as used by Sherline’s cnc machines. Before calling Sherline, please look over this list to see if an answer to your problem has already been posted. If you do call, please have your version number and/or approximate date of purchase ready. CAUTION: When opening up your computer or driver box, please take appropriate grounding precautions to assure that static electricity does not damage delicate components on your circuit boards. Ubuntu version (EMC2): In the top menu bar of the desktop click on “System.” In the dropdown menu, click on “About Ubuntu.” In this box it will list the current version number. Debian version (EMC): When booting up the computer, after the biostar logo appears on the screen a version page will show briefly. Hit the up or down cursor arrow on the keyboard to freeze the screen so you can copy down the version number. Also, look at the backup CD’s that came with your computer or driver box. The Instructions/Utilities disk and Installation disk should have Sherline’s version numbers noted on them. This is the most common call we get. Most likely you have not connected the 25-pin parallel cable to the computer. This cable, which sometimes used to be referred to as a “printer cable” comes from the driver box in the bottom of the computer case, and the other end must be connected to the computer’s parallel port. This is how the computer communicates with the driver board and stepper motors. In mid-October, 2011 replaceable fuses were added to the driver circuit board for additional protection. A blown fuse on one or more axes can be due to any of several different reasons; such as, motors plugged in or unplugged while the power is on (“hot plugging”), stalling or over-driving a motor by taking too heavy a cut, etc. Programming is done on the basis of APPARENT TOOL MOVEMENT which is the opposite of XY table movement, so some new users assume the X and Y axes are moving in the wrong directions. Before making any changes be sure the direction actually IS wrong. CAUTION: Values in the .ini files control all the functions of the EMC2. Do not change these values unless you are an experienced Linux and EMC2 user or are carefully following these instructions. When you’re finished making changes, restart the EMC2 program for your machine. A reboot should not be necessary, but is a good practice to make sure the changes take effect. Should you ever need original copies of the .ini files, replacements (and their instructions) can be downloaded at the EMC section of the Sherline website at INI File Replacements. We recommend copying the existing ini files and saving them under a different name before attempting modifications. If your changes do not work, you can always go back to your original configuration by replacing the updated files with your copy of the original. Computers can be maddening devices because they demand accuracy beyond what normal human beings find useful. This can be especially true when producing cnc programs, and where this condition shows up the most is when you are working with radius ending points. In order to cut a curve, the g02, g03, and r commands must be used. When you use these commands, you must tell your computer the exact ending position of the curve. The computer will give you a message stating that your end x/y position is in error, but it will not fix it for you. The computer is demanding an accuracy far greater than the user believes the part needs and who may have carelessly made a few rounding errors. Because Sherline cnc customers have been having problems with this, we decided in 11/06 to open up this tolerance up to a maximum error of 0.001″ (0.002 mm) standard. About a quarter of the way into the file you will see the section labeled “; Axes sections ————-” where the settings for all four axes are located. For each axis you wish to change the scale on, go down to the lines that read “INPUT_SCALE =” and “OUTPUT SCALE =”. These values are normally 16000 (or -16000) in the Inch .ini file and 800 (or -800) in the Metric .ini file. Changing these values will affect how far the axes travel for every unit jogged. For example, dividing the values by 10 would cause an axis to move .1″ when jogged by 1″. So, when a machine is switched from a standard 20-TPI leadscrew to a 4-TPI leadscrew, for instance, changing the scale values from 16000 to 3200 would compensate for this and return the machine to a normal movement scale. When changing these values, make sure to leave the number either positive or negative, as changing this will reverse the direction the axis moves unless this is what you want to do. A fact when dealing with stepper motors is that the faster they turn, the less torque they have. This is because the power for each pulse is on for shorter periods of time; therefore, it’s a good idea to keep feed rates 20% below maximum when running programs with many short moves, particularly on the Z-axis. The maximum feed rate in EMC2 is 22 in/min. Therefore it is good practice to keep your feed rate below about 18 in/min or 450 mm/min. Some of our customers have counterbalanced the weight of the Z-axis with a simple rope-pulley-weight device to reduce wear on the Z-axis leadscrew. See the CNC Project section of our website for a photo and description of how one person did this. You’ll find that the stepper motor system we use quite reliable and capable of running complex programs without losing steps when used properly. If you are using the LinuxCNC and using the Sherline Base Page that comes with our disc, then the tooling page is different than the LinuxCNC tooling page. On the Sherline Base Page, when you first install it and click on the Tooling page you will see what I show below. All of the tooling information that is shown on the original page is Sample Info and it doesn’t work. Very Important: If you just edit the Sample info that is already on the tooling page and put in the tool info for the tools that you are using, it will not work! You need to get rid of all of the sample information and start fresh. In order to input any information into the tooling page that will work, you need to remove all of the default tooling information. To do this you click on “REMOVE LAST TOOL” three times. This will get rid of the tooling info for the three tools shown above. Then you click on “ADD EXTRA TOOL”, and input your real tool information. Sherline CNC lathe and mill shown making parts for the new Sherline lever collet closer. 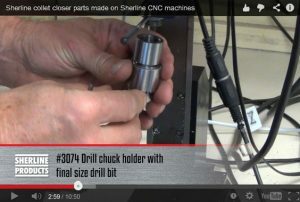 If you check out this video you will see a Drill Chuck Holder #3074 and other end mill holders in use. 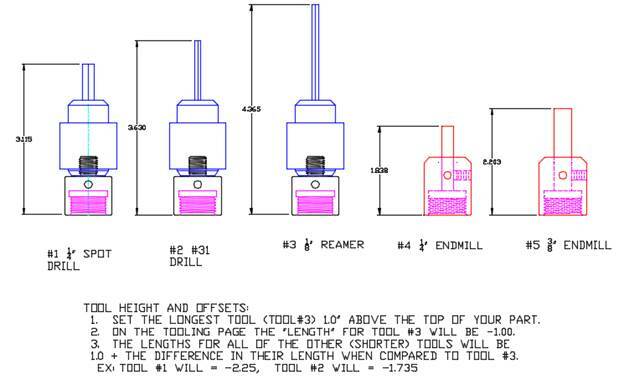 If you use the #3074 for all of your drills and the endmill holders for your other cutters, setting up your tools and your tool offsets is very easy. The endmill style holders all locate against the shoulder of the headstock spindle. If you use a separate holder for each of your tools, you can measure the overall length of the tool and the holder for each tool. 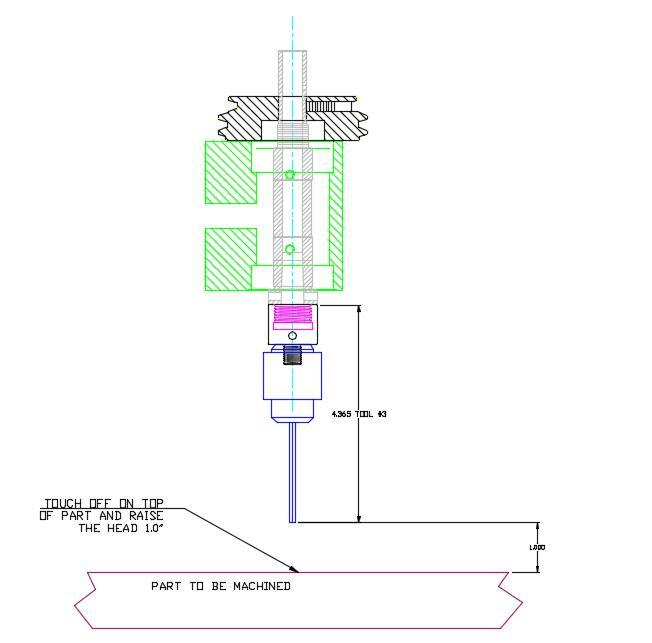 You set up your Z Home position by putting the longest tool on the spindle (in the diagram below it is tool #3). Then you lower the tool until the tip of the tool touches the top of the part (use a piece of .001 shim stock as a feeler gage for tip contact with the top of the part). Then you raise the head 1.0” (or whatever amount of clearance you want between the tip of the tool and the top of the part). 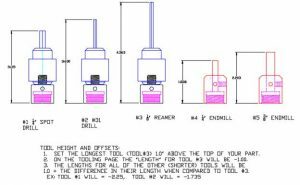 This Z level is now your Z home position that all of your tool offset lengths will be set from. If you use this method, setting up your jobs will be easier. Depending on how old your computer is, you may or may not be able to upgrade to the latest version. As each version has been introduced, it has become more sophisticated and requires more system resources to run properly. Over the years we have constantly upgraded our motherboards and memory to keep up with these increasing demands. Any current PC has plenty of speed and memory for running Linux and EMC2; however, finding a new computer with a parallel port is very difficult, as most computers now rely only on USB connections. At this time, USB still does not have the capacity to push enough data through a serial port to run up to four axes reliably at the same time. (Sherline does offer a new computer with a parallel port, built in 4-axis driver board and separate power supply as P/N 87610.) Our current requirements are for at least 512 MB of RAM, at least 800 MHz clock speed and a 25-pin parallel port. Some of the earliest motherboards used by Sherline came with 128 MB of RAM and may not support more than 256 MB in an upgrade. Current versions also come with a CD drive and a USB port and flash drive in place of the original floppy drive. The version of Linux and EMC2 that we supply has been specially configured to match the capabilities of Sherline machines and is not identical to versions that you might download from the Internet from other sources. A copy of the current Sherline version of Linux and EMC2 is available on CD as P/N 8326. It comes with a 2nd CD with the current instructions and free utilities.